Do you have a carnivore in your life that has everything? Why not gift them a Conscious Carnivore gift certificate? Cards are available in amounts of $15 and up and make the perfect stocking stuffer. Steak and Braise boxes available for order! Steak Box includes 3 bone in ribeyes and 3 t-bones/porterhouses for $120 and the Braise Box includes 4 packs of short ribs, 2 pot roasts and 4 cross cut beef shank for $100. CALL OR STOP IN TODAY TO ORDER! 19 days! That's all there is until Thanksgiving day! Don't wait until it's too late and all the turkeys have been gobbled up. We have recently opened up ordering for Thanksgiving turkeys. As in the past we have three options for turkeys this year. All are going to be a hit on your Thanksgiving table. Pick up dates will be Monday, November 20 (10am-4pm); Tuesday, November 21 (10am-7pm); Wednesday, November 22 (10am-7pm). All orders require a $25/bird deposit that will be applied to the final cost at pick up. Need your turkey de-boned, cut up or spatchcocked? We can do that! De-boning is an additional $20, and spatchcocking/splitting/cutting is an additional $15. Extra charges are to be paid for at time of deposit. All deposits are considered non-refundable except on a case by case basis. Have any questions? Stop in or give us a call (608-709-1418). We're clearing out our old styles of t-shirts to make way for 2 brand new designs! Get 50% off all kids and older styles of adult t's. 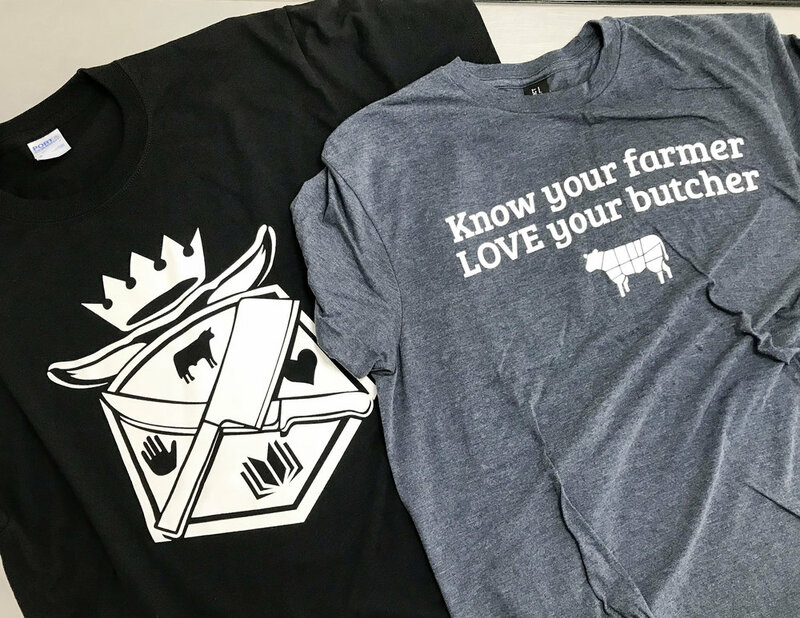 Both new shirt designs are $20 each and we are stocked in a full range of sizes. It's Time to Talk Turkey! It's hard to believe that Thanksgiving is right around the corner, but here it is, nearly November already! It's been a wonderful summer and start to fall, but it's time to buckle down and start thinking about holiday gatherings. Conscious Carnivore "LOVE Your Butcher" Bumper Stickers - $1.00 ea! Pinzgauer-Scottish Highland Cross in the case this week! The beef featured in our case this week is a Pinzgauer-Scottish Highland Cross, raised by Janine and Thomas Mauel in Blue River, WI. The Pinzgauer is a rare Austrian breed that is known for its intense red color and exceptional tenderness and flavor. Scottish Highland are small cattle with great flavor and color. Being a small beef breed, the cuts are smaller and more personal sized, unlike larger steers such as Angus or Hereford. The cross breeding of the Pinzgauer and Scottish Highland produces delicious, tender beef , well-marbled and nicely red. The crossing of breeds also produces larger buts, but still of manageable size. The steer we have will be in the case throughout the weekend. Stop in early, as we're expecting it to sell quickly. Save $1.00/pound on all FRESH & SMOKED PORK SPARE RIBS! Stock up this weekend. They'll sell fast and we have limited quantities, so come in before they're gone! Print off the coupon below to save $5.00 on any purchase of $35 or more! Don't have a printer? Flash us this email on your phone and you too can save! 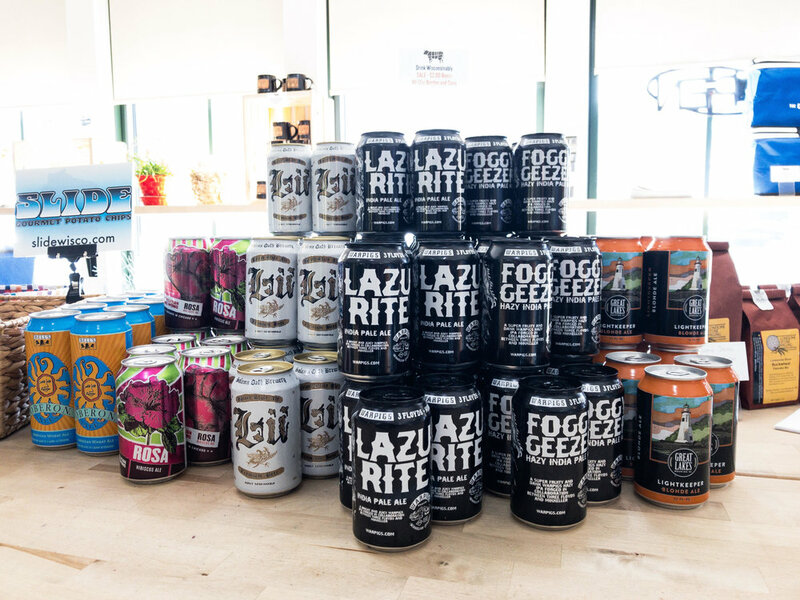 Grinder Boxes, New Ciders, Sale Items and a Coupon! Did you know that we always have Grinder Boxes available to order? Grinder Boxes are an economical way to stock your freezer with great tasting ground beef. Included in each $55 box is 6 pounds grass fed ground beef, 1 pound taco beef and 1 pound Italian beef. Call or stop in to order yours. Pick up is every Friday. Want a different selection? Mix and match with your choice of ground beef, taco beef and Italian beef. Let us know what you want and we'll box it up for you! Restoration Cider Co. has made their first delivery to the shop! Great ciders, semi dry and refreshing and perfect for the upcoming summer. Restoration Cider has been around a while and has just started bottling their delicious of Madison-made brew. Paul made his first delivery yesterday! What's also great is that 5% of all profits are donated to stream restoration projects in Wisconsin. Tastes good, does good. What could be better? Stop in and get $1 off per pound on frozen Sausages, Meat Loaves, Meat Balls, Smoked Ham Hocks, and Burger Patties! Stock up and save! Print out the coupon below and get $5 off a Conscious Carnivore insulated shopping/picnic basket! Get one for yourself or use it for a great gift bag. Shopping Baskets are regularly priced $25. With much anticipation, we are welcoming Chaz from Grassway Organics and his wonderful pork. We've loaded the case with his outstanding organic pork! He'll also be in the shop Saturday, March 25 from 12-2. Stop in and say hi, learn how and why he chooses to farm and pick up some tasty pork for the weekend. Grassway Organics is a certified organic dairy farm located on a winding country road near New Holstein, WI. Sunshine, fresh air, exercise and nutrient-dense soils are their basis for healthy, happy animals. This translates into healthy food that nourishes you. All of their animals live and graze certified organic pastures and eat all organic feeds. Their beef, pork, chicken, turkey, and eggs are available in an on-farm store where we also sell various organic foodstuffs. Easter is just around the corner on Sunday, April 16, and we are now taking orders for hams and lamb. Whether you are interested in bone in or boneless ham, or a variety of lamb cuts, The Conscious Carnivore has many options for you. Stop in to pick out your favorite or talk with one of our knowledgeable staff and let them help you choose. Just in time for the beginning of the grilling season, we've brought in two new BBQ Sauces, and they are great! Lillie's Q -- From Carolina to Smoky, each of the Lillie’s Q sauces is made from a unique blend of all natural ingredients and pays homage to a specific Southern region. So whether you’re in the mood for a bite of South Carolina pepper, a sweet and tangy Alabama original with a pinch of Cajun spice, a touch of Memphis sweet brown sugar or the bold and spicy cayenne of North Carolina, Lillie’s Q has a sauce to fit every mood, and every dish this side of the Mason Dixon. Uncle Louie's -- For more than 50 years, Uncle Louie made batches of his secret BBQ sauce at his home in Mayville, Wisconsin. Uncle Louie's love of grilling was known throughout the area and he was always willing to cook for parties, often using his secret sauce. Everyone who tried Uncle Louie's sauce loved it, so he began giving jars of it away to people who asked. In 2012 he even shipped a jar of his secret sauce to a friend who entered, and of course won, a BBQ competition in Pennsylvania. The unique packaging of the sauce pays homage to the 1000s of jars Louie gave away. Valentine's Day is right around the corner and The Conscious Carnivore will be stocked with dry aged beef and lamb, guaranteed to have your love shouting out, "That's Amore!" Stop in today to pick up your heart's desire! Slow Food UW will be here on Sunday, February 12. Slow Food UW is helping promote good, clean and fair food for all. Stop in to learn more. The Conscious Carnivore will be donating 3% of the daily sales to support this great group. We will also be closing early on Sunday, February 12. We'll be closing up shop at 4pm for a staff event. We will reopen at our usual time on Monday. Thanks, Carnivores! Have a great weekend and Valentine's Day! There's still time! Taking orders for holiday roasts! There's still time to place your order for Christmas! Now that Christmas and Hanukkah are mere days away, don't delay ordering your holiday roast. The Conscious Carnivore has all the cuts you'd want to grace your holiday table. All pre-orders have a $20 deposit that is taken at the time of order. Interested in beef, ham, pork, lamb, chicken or turkey? Give us a call (608-709-1418) or stop in to place your order. Don't know what you need or how much? Any of our friendly staff members can help you make the best choice for your gathering. We're not just about great meat. While finishing up your last minute gift shopping, don't forget to stop by The Conscious Carnivore. We have an extensive selection of locally produced preserves, honey, maple syrup, mustard, BBQ sauces and coffee. We also have gift cards in any amount over $20. Perfect for every carnivore in your life. Looking for an appetizer? Check out the freshly stocked deli cooler--full of Wisconsin cheeses and cured meats from Red Table Meats--our selection of Potter's Crackers and preserves from Quince & Apple. From everyone at The Conscious Carnivore, we wish you a wonderful holiday season and a very safe and happy 2017! Because of all of you, 2016 at the shop was so great. We had the chance to strengthen our friendships with our customers and meet so many new people. Without you (yes, I'm talking to you) and our farmers, none of this would be possible and we're so incredibly grateful. Thank you! Now that Thanksgiving has come and gone, it's time to start thinking about Christmas, Hanukkah, Kwanza, winter solstice, and other gatherings of family and friends. Whether you are interested in a standing rib roast, tenderloin, pork loin, leg of lamb or any of the other myriad of roasts, The Conscious Carnivore has you covered. Stop in or call (608-709-1418) to discuss your options with any of our friendly and knowledgeable staff. You know that The Conscious Carnivore carries a fantastic selection of great tasting humanely-raised, antibiotic and hormone-free meats, but have you browsed though our selection of Wisconsin cheese from Uplands, Landmark Creamery, Roth Kase, Edelweiss, LaClare Farms, Bleu Mont and Nordic Creamery? When you stop in for your cheese, don't forget the accompaniments: crackers from Potter's Crackers, preserves from Quince & Apple, and salami and cured meats from Red Table Meat Company. Create an impressive--and more importantly--delicious spread this holiday season. The Conscious Carnivore is a great place to not only buy for your own table, but gifts of meat make a wonderful gift for every carnivore in your life. Don't know exactly what they'd like in their stocking? Gift cards are available and take some of the stress out of choosing the perfect gift. Gift cards never expire and can be purchased by stopping in the shop. They can be purchased in denominations of $25 and up. Gobble, gobble, Carnivores! It's that time of year again when the holiday season is right around the corner, and everyone starts making their plans for Thanksgiving. We have limited numbers of turkey pre-orders left. Please stop in or call the shop to place your reservation. Remember, quantities are limited, so the earlier you place your order the better. Antibiotic-free local broad-breasted whites from Ney's Big Sky in Manitowoc. These are delicious birds, raised naturally without antibiotics nor hormones. They are $5.00 per pound and will run about 10-12 pounds ($20 deposit). Amish Organic broad-breasted whites, raised by farmer Dan Schmucker. Another wonderful turkey to grace your feasting table. They are $10.00 per pound ($50 deposit). Customer favorite Royal Palm Heritage turkeys from Bryant Family Farm in Hollandale, Wisconsin. Nico Bryant does an amazing job raising his pasture-raised, free-foraging turkeys. The Royal Palm is a beautiful bird that sets itself apart on the dinner table. They are $11.00 per pound ($50 deposit) Sizes range from 10-14 pounds. Call or stop in Tuesday to reserve your Thanksgiving table centerpiece. Gobble, gobble, Carnivores! It's that time of year again when the holiday season is right around the corner, and everyone starts making their plans for Thanksgiving. We will be starting to take turkey orders on Tuesday, October 4th. Stop in or call to place your reservation. Remember, quantities are limited, so the earlier you place your order the better. Antibiotic-free local birds from Ney's Big Sky in Manitowoc. These are delicious birds, raised naturally without antibiotics nor hormones. They are $5.00 per pound and will run about 10-12 pounds ($20 deposit). Amish Organic turkeys raised by farmer Dan Schmucker in Cooksville, Wisconsin. Another wonderful turkey to grace your feasting table. They are $10.00 per pound ($50 deposit). Customer favorite Royal Palm Heritage turkeys from Bryant Family Farm in Hollandale, Wisconsin. Nico Bryant does an amazing job raising his fully pasture-raised, free foraging turkeys. The Royal Palm is a beautiful bird that sets itself apart on the dinner table. They are $11.00 per pound ($50 deposit) Sizes range from 10-18 pounds. The Conscious Carnviore will be closed on Monday, October 3rd for our quarterly inventory. We will re-open with normal hours on Tuesday. We apologize for any inconvenience. To celebrate the end of summer and the last hurrahs before school begins, we are having a sale on all frozen sausages! Save $1 per pound off any variety of our house-made frozen sausages. Whether you like our traditional bratwurst or more exotic gyoza sausage, now is your time to stock up and save. Sale goes through Sunday, August 13th. Have a free Friday night? Tonight, Friday, August 12 at 6pm, we have a few openings in our Bacon Class. Learn how to make your own bacon, and get your own full pork belly to flavor! We'll then smoke it for you so you can pick it up a couple days later and have your complete fill of bacon, and then some. The class fee is $90. Call the shop to register, 608-709-1418. Bulk Meat Boxes and Coupon Savings! Fill your freezer! Finding yourself with an empty freezer and have the need and inclination to fill it up? We can help. Whether you are looking to stock up with a 1/4 beef, half a hog or a whole lamb, or simply great tasting grass fed ground beef or burger patties, we have a bulk option that will fit your budget. Click over to our website for full details. Show your carnivore pride with a Conscious Carnivore t-shirt. Perfect for the summer, these soft heathered-blue shirts are so comfortable and will soon be your favorite warm weather shirt. Save $5 with coupon on your choice of t-shirt, youth or adult. You know that we have great meat, but have you taken a look at our selection of tasty coffee from Colectivo Coffee, out of Milwaukee, Wisconsin? From light and bright to dark and bold, we have a coffee that will make getting out of bed a little less dreary. Use the coupon below to save $5 on your purchase of 1# Colectivo Coffee and a custom Conscious Carnivore mug by local artist JD Wolfe. Make your mornings great! Happy Summer! Our new class schedule for July-September is now posted on our website. We are offering 3 bacon classes, 2 hole hog butchering classes, and 1 whole lamb butchering class. They are a fun way to get a bit closer to your meat, learn what goes in to the process of whole animal butchering, and you even get to take home a portion of the night's work! We're also running a special on our blue insulated shopping baskets. Use the coupon below to save $5 (regularly $25 each). Today we're writing requesting your help and support. Last week a great friend of The Conscious Carnivore, Steve Acheson, had to undergo emergency back surgery for a condition called Cauda Equina Syndrome. This syndrome is the equivalent of a stoke or heart attack for the back. Even if the pressure is alleviated within twenty-four hours through surgery, nerve damage could be permanent. Steve's surgery removed a large part of a disc in his back to relieve the pressure on his spinal cord. Because the road to recovery is still uncertain, he and his family are not sure what they will be looking at for future medical expenses. Steve and wife, Stephanie, run Peacefully Organic Produce & CSA--much of his produce we use in the shop--and while he is in recovery won't be able to work on the farm. Everyone that works at the farm is pitching in to make sure all the farm work, CSA, and farm markets can still be a possibility this year. The Conscious Carnivore will also be hosting a 4 for Peace this weekend. We will be donating 4% of our sales Saturday-Monday to Steve and his family. Please do stop in this weekend and help us support our friend. Thank you. Wishing you all the best. Just a reminder, on June 10th at 6pm Butcher Dave will be leading our quarterly Beef Hindquarter class. Get a up-close view on butcher a hindquarter of beef and test your hand with a knife and saw. Best part--take home around 15# of meat butchered from the night's fun. Space is limited to 10 participants, so be sure to call soon to register. The class is $190 and includes the experience of butchering, a portion of the night's work, Butcher Dave's sun-shiny face, and a free beer or soda. The Conscious Carnivore is offering a whole lamb bulk meat special price. We have two lamb we are selling at a $400. Get $100 off when you order one of these two lamb. Choose how you'd like it butchered, and pick it up all wrapped and ready for the freezer. This special price does not include ground lamb. Summit Brewing Sampling Event and Mangalitsa Week! May 21, 2016, Summit Brewing Sampling @ The Conscious Carnvivore; 11am-2pm-- Join Ross Fahey from Summit Brewing as he samples his beers. We'll have specials on Summit Saga and samples of Saga beer brats. Beers and brats will be for sale in the shop. Memorial Day weekend we'll be featuring Mangalitsa pork in our meat case, including trotters, shanks, skin, ground back fat, bone-in loin chops, loin roasts and shoulders. We don't get this wonderfully fatty Hungarian breed too often, and when we do it sells quickly. Mangalitsa is a darker pork with a large fat cap and taste leaning towards wild boar--earthier than Berkshire or Red Wattle, and oh so delicious. Hi Carnivores! Spring looks like it's finally here to stay and to celebrate the grilling season we're bring in some great new items from Madison Sourdough! They will be available at the shop Thursdays-Sundays only. We're also excited to be Madison Sourdough's first retail location to sell their new Brioche Burger Buns!! We met with MSCO last week and tasted these delightfully light and buttery buns and know they're going to be a hit this summer. Quantities will be limited so be sure to stop in early to get your bread and buns. FILL YOUR FREEZER WITH SPECIAL OFFERINGS FROM THE CONSCIOUS CARNIVORE. WE ARE NOW OFFERING BULK MEAT BOXES AND WHOLE, HALVES AND QUARTER ANIMALS. Whole Berkshire Hog: $700; $100 deposit-- About 180 pounds. 1/4 or 1/2 Beef: $4.25/pound carcass weight, averaging $7.00/pound cut weight; $100 deposit-- 1/4 steer about 160 pounds hanging weight; 1/2 steer about 320 pounds. 1 month lead time needed for order. Grinder Box: $55; paid at time of order-- 8 pounds total consisting of: 6-1 pound packages of ground beef, 1 pound taco meat & 1 pound hot Italian beef. Pub Burger Box: $55; paid at time of order-- 6 packages of 4- 1/3 pound unseasoned ground beef patties. The spring class schedule is post in the shop and online. Click HERE to see the current offerings, whether you are interested in Bacon, Beef Hindquarter, and Whole Lamb. Hello, Carnivores! There are a lot of events planned for May, and we hope you can make it to them. Cinco de Mayo, May 5, 2016 @ Blue Moon Bar & Grill; All Day-- We'll be making three special sausages for you to pair with a Lagunitas and Founders Tap Takeover. May 7, 2016, Alt Brew Tap Room-- It's Craft Brew Week and celebrate with Alt Brew and The Conscious Carnivore. Sample Alt Brew's amazing gluten-free beers while enjoying our gluten-free beer brats, featuring Alt Brew's Farmhouse Ale. The spring class schedule is post in the shop and online. Click HERE to see the current offerings, whether you are interested in Bacon, Beef Hindquarter, Sous Vide and Whole Lamb. Woody Tasch, founder of Slow Money, will be giving the morning key note speech. Six years after Tasch’s 2010 book Inquires into the Nature of Slow Money launched the concept of Slow Money into the national spotlight, he will speak on what is happening around the country and the ever increasing relevance of Slow Money in today’s world. One One Thousand. Madison, WI. Please also join us at our free kickoff event at Alt Brew on April 29 from 5:00 to 9:00 p.m. celebrating craft beer, smart businesses, and good food. While all your friends are thinking of ways to trick you today, we're not foolin'. All sausages, fresh or frozen, are $1 off per pound with the following coupon. Either print it off or bring it in on your phone and get the special price. Choose from traditional choices like brats, Polish, and andouille or get a bit more adventurous with Greek style, blueberry breakfast, and beet caraway.